by Brianna Crandall — July 11, 2018 — Herman Miller, a globally recognized 112-year provider of furnishings and related technologies and services, introduced several innovative products at the recent NeoCon 2018 commercial interiors show. A previous FMLink article showcased the company’s Best of NeoCon Gold and Silver award-winning products. 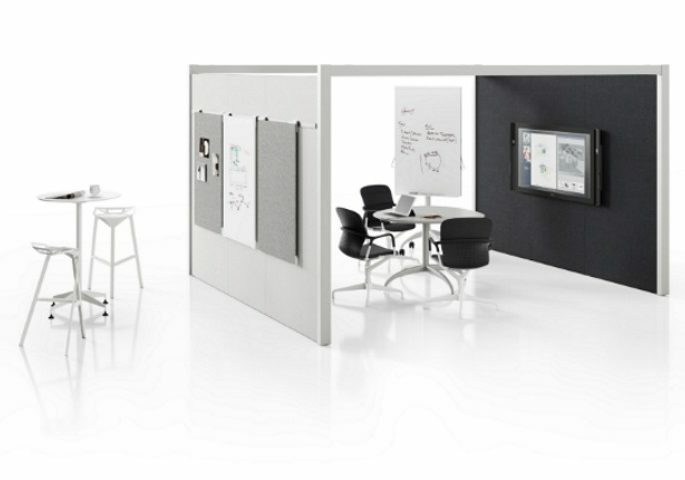 Herman Miller’s Overlay movable walls and Living Office Settings technology collaborations are highlighted below. Organizations don’t always have the time or money to reconfigure their offices, even when it’s obvious that an updated space would help people work more effectively and help the organization accomplish strategic goals, the company points out. The movable walls can be used to create freestanding rooms, give shape to open spaces, or simply divide areas. A three-sided workspace can become a designated area for impromptu meetings or collaborative work, for example. Or four Overlay walls can create an enclosed meeting space — complete with a door — that offers some visual and acoustical privacy. Overlay also brings visual clarity to open-plan offices. Drawing inspiration from urban planning concepts, Ayse Birsel and Bibi Seck designed Overlay to create a pattern of integrated but distinctive settings that help people navigate the workplace. A sea of workspaces without clear divisions can look and feel chaotic. Overlay makes spaces legible by defining areas where people can go to collaborate and catch up, or hunker down and work alone. Overlay’s quiet aesthetic can be turned up or dialed down — outfitted with a variety of textiles, laminates, glass, white boards, or custom materials — to reflect the character of an organization. Overlay reconciles seemingly opposite needs and wants — open yet closed; alone yet together; clean yet messy. As Birsel says, “If you can make any two opposites co-exist, you can have your cake and eat it, too.” When it comes to the office, Overlay reportedly makes it possible. Herman Miller notes that the company’s research has given it a deep understanding of how people work and the tools and furnishings they need to do that work, which enables Herman Miller to work with technology partners to streamline the process of creating, specifying, and deploying integrated solutions to help customers and their design partners save time and money. Logitech — As teams continue to become increasingly dispersed, Herman Miller and Logitech strive to make remote video conferencing more intuitive, effective, and engaging through thoughtfully integrated furnishings and collaboration tools. The environments they create are places where people feel more connected to each other and to the work they are sharing. Whitlock — For US customers, Herman Miller works with Whitlock to offer full-lifecycle media collaboration services. The partnership ensures an attractive, comprehensive setting design that provides an uncomplicated and well-integrated audio, video and team working experience with an option for 24/7 support. Genesis — For Canadian customers, Herman Miller is partnering with Genesis, a national collaboration firm focused on Connected Experiences — how people use and adopt technology in their spaces. Herman Miller works closely with Genesis on every element of projects to achieve seamless furnishing and technology design and deployment. Crestron — Together, Herman Miller and Crestron solve calling, conferencing, collaborating, and presenting challenges so the experience of meeting is more intuitive and productive. Herman Miller’s Living Office design framework and Crestron’s technology solutions shape workplaces that ignite people’s potential. Robin — Robin makes it easier to find and schedule the right room with the right tools so people and organizations can operate more efficiently. Using Robin room utilization, Herman Miller and its partners help organizations optimize the spaces that are underperforming. Clients in North America can leverage Herman Miller’s Workplace Services capabilities to gain settings that help better position organizations and their people for success. These results include places where furnishings, tools, and technology align with the needs and daily activities of the workforce, while simultaneously addressing the organization’s real estate and financial goals. With this seamless experience, people are free to think, create, and connect in meaningful ways, says the company. For more information about Overlay or Living Office Settings, visit Herman Miller’s NeoCon 2018 landing page. Best of NeoCon 2018 winners announced! See this year’s top furnishings, products and technology for commercial interiors June 13, 2018 In "Products and Services » Furniture & Furnishings"
Find out how Ergotron’s new sit-stand desk enables students to experience the benefits of low-level physical activity in the classroom at a lower price point May 19, 2018 In "Products and Services » Furniture & Furnishings"
How can office furniture and layout be used to attract and retain workers of all ages? December 12, 2018 In "Surveys and Trends"